WASHINGTON — Violent storm clouds and molten-iron rain may be common occurrences on the failed stars known as brown dwarfs, new research suggests. Astronomers used NASA's infrared Spitzer Space Telescope to observe brown dwarfs, finding changes in brightness that they believe signify the presence of storm clouds. These storms appear to last at least several hours, and may be as tempestuous as the famous Great Red Spot on Jupiter. Brown dwarfs are cool, star-like objects that don't have enough mass to fuse hydrogen into helium, the main energy source for stars. They can be considered the giant cousins of planets like Jupiter. Heinze and his colleagues measured the brightness of 44 brown dwarfs for up to 20 hours, as part of Spitzer's "Weather on Other Worlds" program. 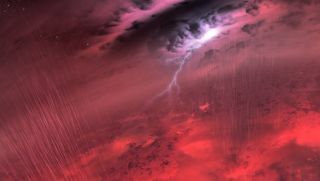 Previous research suggested that brown dwarfs had stormy weather 5 to 10 percent of the time, so the scientists expected to see some variation in brightness. But surprisingly, almost half of the brown dwarfs observed showed such variation. Taking into account the fact that about half of the brown dwarfs are oriented such that storms are hidden, or simply unchanging, the data suggest that turbulent storms on brown dwarfs are common. "We're talking about cloud masses larger than the Earth forming and dissipating over the timescale of just a few hours in some of these objects," Heinze told SPACE.com. These clouds are much too hot to be composed of water. Instead, astronomers believe they are made up of sand and molten iron. Spitzer monitored the storms for less than a day, so astronomers don't know whether the storms persist for months or years, like Jupiter's Great Red Spot. In some cases, the storms are clearly dynamic and rapidly changing, Heinze said. The brightness observations were only possible because Spitzer is above Earth's atmosphere, where our planet's glowing heat doesn't obscure them. Another surprise from Spitzer's observations was how slowly the brown dwarfs rotated. Conventional thinking held that brown dwarfs spin quickly when they form and contract, without slowing down as the orbs age. The team doesn't know why the brown dwarfs spin so slowly. They may have formed in an unusual way, or they may be dragged by gravity from an unknown closely orbiting planet. Studying weather on brown dwarfs could widen scientists' understanding of weather on giant planets outside the solar system, which are harder to see because of the glare of their host stars, researchers said.